Micro-content isn’t widely understood or consciously used. When it is, it’s usually by marketing for social media content. But micro-content may be the most important content type you have, and you probably don’t manage it. Examples include a sentence, a paragraph, an image, a 20 second video, a checklist, a quotation, an answer to a question, research results or facts. It can be stand alone, as Nielsen and most others consider it. It can also be source for any new content. 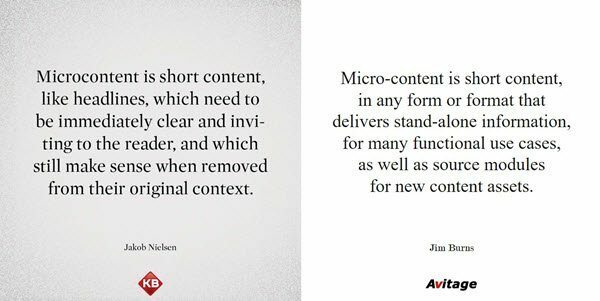 Either way, micro-content is an under-used content type. And it’s not limited to marketing. Significant impact on job performance and business outcomes across your entire organization can be realized by applying the uses introduced below. When you shift your orientation from marketing, social engagement and promotion, and even web content, to a broader perspective focused on content creation, delivery and use techniques, new possibilities emerge. This type of content works best when it’s editable text and graphics not stored in documents. This means it can be easily modified or updated. Ideally it can be accessed and instantly used within common business systems. For example, to respond to customer questions, whether on a sales call or customer support line. We were fortunate early in our business to be introduced to a sales methodology company. We learned the value of documenting and actively using all the elements that comprise a sales playbook. It improved individual selling, and accelerated our new customer acquisition and revenue growth. 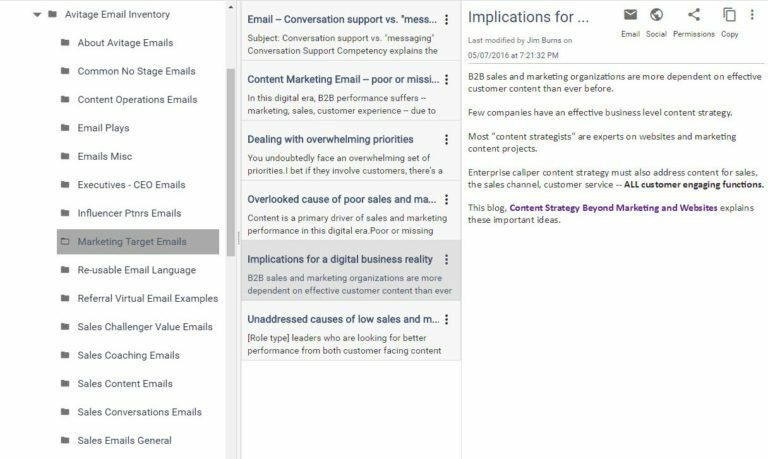 Professionally created and A/B tested emails that link to appropriate content assets suitable for sales prospecting. Link library of URLs for all web assets — blog posts, pages on your web site, online videos in YouTube or the company video management application, or specialty web pages. Inventory of social media posts designed for each channel (Twitter, LinkedIn, Instagram, Facebook) accessible through a common search mechanism. When micro-content is managed as editable text and graphics there is greater flexibility for how it can be updated, delivered and used. Knowledge and performance support, for sales or any “knowledge worker,” ideally “shows up” within common business systems. Examples include: Outlook, Word, CRM (Salesforce, Microsoft Dynamics), collaboration and support applications. We became proficient with micro-content over a decade ago in our content business. We were creating PowerPoint and other content for ourselves as well as other B2B organizations. We did this work guided in part by frameworks based on customer questions and conversations. We discovered sales people needed “visual support” — individual slides for key conversations. Sales people have far more conversations than formal presentations. They often need a single image or diagram to help explain a complex or important point. Customers also want those visuals. The need aids to help conduct similar conversations with internal stakeholders, when sales reps aren’t present. Webinars were another big part of our business. In tracking viewing behavior of archived or on demand webinars we discovered viewing frequently dropped off early, often before important information was delivered. The number of viewers as well as time consumed increased significantly when we edit full webinars into short sections. For each section we created 60 second previews. Micro-content. The increase was often 4-6 times the number of people who viewed the original program. Today, with attention spans notably short, you have literally seconds (8-10 seconds) to capture attention and generate interest. You must promote all marketing content. Micro-content is often the first asset most viewers should receive. It aligns to their consumption preferences. It should hook and motivate viewers to invest time in your full asset. Here’s an interesting example from a company called Slapfive. They have designed a process supported by software to capture short “voice of the customer” explanations through self-provided audio or video files. Micro-content can come from chunking or atomizing any long-form finished asset. This is one of the most important practices we developed in our custom content business. It provides leverage, reduces creation time, and improves content quality. We refer to this as Content Source and have written about this practice here. We started by maintaining a library of common phrases we wanted to easily find and consistently use in other content. This expanded to inventories of common research results, facts and quotations to use in new assets. Our inventory also includes links to important internal and third party web articles we would reference. Content marketers know that content relevance significantly improves content performance. But this is also very challenging. Consider a common scenario where a company sells solutions that address multiple business problems, into multiple industry segments, to multiple personas. To create multiple versions of a major asset such as a white paper, that’s tailored for just one category is significant, let alone all three categories. Rapid response to customer questions is mission critical for customer service and support organizations. When this knowledge isn’t only in key people’s minds, it often resides within documents and multiple systems across an organization. By extracting and preparing micro-content answers, this information can flow into operational systems for instant access, use and delivery. This includes images, short videos or diagrams to support the advice provided by customer service agents. To respond quickly to candidate questions, human resource professionals need instant access to a repository of micro-content answers to specific questions. Leading organizations are harvesting content snippets from existing PDF and other documents. Assets are often linked to original documents or resources that provide more extensive explanations. Assets are prepare for delivery through email and social channel. Individual, stand alone micro-content applies in every business function. It improves performance by providing embedded knowledge and performance support aids. Micro-content is a highly appreciated asset type by short-attention content viewers. It applies to delivery through social channels, as well a front-end to longer-form assets. This improves performance of marketing content. It also meets many important sales and channel-sales use scenarios. As re-usable Content Source, micro-content reduces research and search time for inputs to new content assets. Micro, modular and configurable content improves content quality through highly-tailored, relevant audience and situation-specific versions. Micro-content plays a significant role in resolving the universal challenge of scaling content operations and outputs, without compromising cost, time, or quality. The post Micro-content — the most important content type you don’t manage appeared first on Avitage.